I found this book to be quite trivial. It pulls together previous essays that Roediger has written with some new material, and focuses its attention on a selected history of pro- and anti-“identity politics” commentators, together with extensive personal anecdotes. The book’s major fault is that its central premises are disingenuous. Roediger claims in the introduction to have undertaken self-criticism. But on close examination that is not exactly what he does. Rather, he carefully frames his self-criticism in order to advance certain underlying ideological presuppositions, and to signal that he identifies with certain groups and not others. He claims that he is investigating the need to engage in both theory and action. Yet he ends up not really questioning his theoretical assumptions much, and dwells on action. So, for instance, he opens the book with a mild critique of David Harvey, only to immediately signal that his disagreements with Harvey and a few others are really minor and constructive and that they are really on the same side — by which he means they can both support “identity politics” and craft/trade union social democracy. He then mentions the anti-“identity politics” positions of Walter Benn Michaels and Adolph Reed, Jr., dismissing them as “simplistic”, and, later in the book, also dismisses the work of Pierre Bourdieu and Loic Wacquant and others’ similar views. And yet, Roediger’s dismissal of these contrary positions actually reveals much more about his own simplistic frame of reference than it explicates the supposed flaws of these other thinkers. For example, Roediger argues from the vantage point that craft/trade union advocacy is of crucial importance, that “Marxism” is about “class” identity rather than a universalism of shared antagonisms, that such groups tend to have substantially consistent/homogeneous internal cohesion, and, crucially, that “ideology” is not an important framework. Accordingly, his overview of the anti-“identity politics” position (which he clearly rejects) omits any discussion of many of the most prominent recent advocates of that position: Jodi Dean, Alain Badiou, Slavoj Žižek, Sharon Smith, etc. While many of these other thinkers rely on psychoanalysis, it is psychoanalysis of an entirely different sort than what Roediger occasionally references. This is significant. It is possible to disagree with Roediger’s flavor of “class” consciousness and on that basis alone arrive at a different balance of class and race (and gender, etc.) concerns. Much of the book explores a history of what amount to “tactical” considerations, without digging into deeper philosophical and theoretical underpinnings. While some of Roedinger’s statements ring true, I tend to think a better and more far-reaching formulation of the theory and action dialectic that Roediger professes to apply in this book is stated by Paulo Freire in Pedagogy of the Oppressed, for example, or in Antonio Gramsci‘s “critical marxism”. 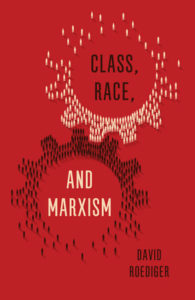 Adolph Reed’s criticism of Roediger and his ilk (echoing Walter Benjamin), that they are part of “a strain of the professional-managerial class whose worldview and material interests are rooted within a political economy of race and ascriptive identity-group relations[,]” seems spot on — hardly something “simplistic”. This is evidenced by the extensive bloviating that Roediger puts forth about academic appointments and the trials and tribulations of various race-conscious academics seeking prestigious university positions. This recalls “lean in” boardroom (neoliberal) feminism, or Maresi Starzman’s critical statement, “Even if precariously employed academics may be, in economic terms, best considered part of the working class, their interests are aligned with the aspiring middle and upper-middle classes. At the end of the day, academic desires — for a career, for status, or maybe for some fame — ensure that even the ‘lumpen professor’ remains a professor, cash strapped but with a solid middle-class habitus. The result is a seeming paradox: an impoverished workforce deeply loyal to the exploitative structures it is embedded within . . . .” It all gets very tedious. I was left feeling that Roediger is furthering a debate in what I consider a cul-de-sac of increasingly irrelevant non-Marxist discourse that panders to chauvinistic craft/trade unions, the university appointment system, and defeatist sentiments that the “communist hypothesis” must be tempered if not rejected. While no doubt, “identity politics” has become hegemonic in academic departments of late, Roediger too easily relies on that hegemony to proffer very superficial criticisms of anti-identity politics positions. But, again, this is essentially a critique of the ideology that Roediger adopts, and Roediger is careful to bracket out ideology from his purview. He also makes some dubious characterizations of fact. For instance, in the introduction he claims that police unions actually have very little power. This is borderline laughable. Take for instance Minnesota, where in around 2011 the police union succeeded in having state law modified to shield them from disciplinary investigations by citizen boards. When Martin Gilens & Benjamin Page released their widely publicized study of the impact of ordinary citizens and unions on government policy, they concluded that unions, as interest groups typically aligned with ordinary citizen interests, have very little influence. These examples tend to show that police unions have considerably more influence than other types of unions, calling Roediger’s claim into doubt. In spite of his claim to be self-critical, he spends these pages mostly trying to rally allies to fend off criticism from the likes of Reed, Benn Michaels, Rob Urie, and a host of others he doesn’t bother to cite — something that is fundamentally populist rather than Marxist, and is not a problem unique to Roediger. It is rather hard to see how this book is of any interest to anyone other than the “opposition” academics specifically mentioned, to the extent that they might wish to rebut specific claims Roediger makes. Though this book is best ignored.